The Greater Oklahoma City Chamber recognizes the benefits of partnerships when working to represent the business community and create a pro-business climate statewide. In 2018, the Chamber will work together with the Tulsa Regional Chamber to lobby the State Legislature on the following issues. The Chambers support identifying, new sustainable revenue sources to address continued state budget instability and multiple years of shortfalls. Funding for essential state services (Education, Public Safety, Health Care and Transportation) has eroded to a level that threatens the national competitiveness of our economy. While the Chambers support continued efforts to seek efficiencies and eliminate waste, those alone will not resolve our long-term needs. We will support new, sustainable revenue sources that are broad-based and do not disproportionately impact any specific business sector to address the state’s challenges. The Chambers support efforts to return State Question 640 to the ballot, lowering the threshold required for a revenue measure to become law. 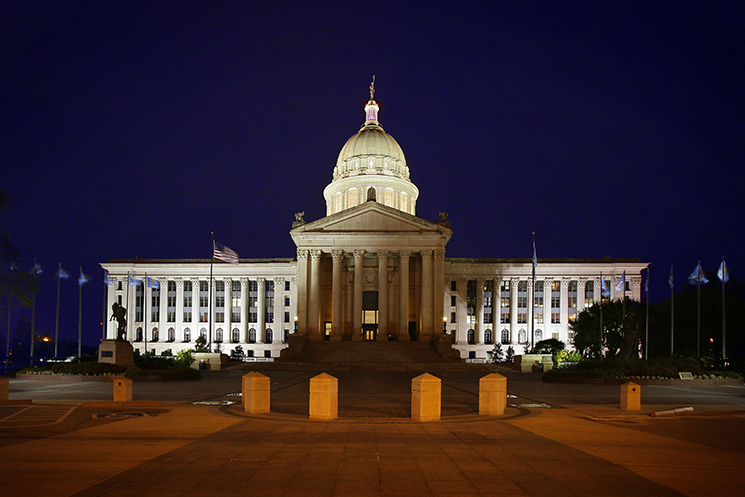 In 2018, the Chambers will support extending and improving the Oklahoma Quality Events Act. The Chambers support the Oklahoma Incentive Evaluation Commission, which was established to make recommendations to the Legislature and Governor on which incentive programs are serving their intended purpose and creating economic/community development. If an incentive program cannot show a positive return to the state, it should be scaled-back or repealed. The Chambers support the 2nd Amendment to the U.S. Constitution and responsible expansion of gun-owner’s rights. However, the Chambers will oppose legislation to allow open/concealed carry of guns into high-economic impact events (many of which are contractually required to prohibit weapons), including: Horse Shows at the State Fairgrounds and Tulsa’s Expo Center, NCAA/Big XII/American Conference sporting events, U.S. Youth Soccer Association Tournaments, the Oklahoma and Tulsa State Fairs, Olympic Qualifying, High School Basketball/Wrestling Tournaments and conventions at the Cox Business Centers. The Chambers will also oppose legislation that would allow guns to be carried on college campuses or limit a Business Owner’s Rights to prohibit weapons. The Chambers will work with the National Rifle Association, the Oklahoma Second Amendment Association and other stakeholders to improve and clarify existing gun laws, while also protecting the public’s safety at the above events, many of which are contractually obligated to prohibit weapons. The Chambers support legislation and funding for sentencing reforms and rehabilitation programs to ease the financial drain on Oklahoma’s criminal justice system, lessen the burden on jails and prisons throughout the state and allow non-violent offenders to enter the workforce more quickly. The Chambers support the recommendations of the Governor’s Task Force on Criminal Justice Reform and will work with other stakeholders to secure their passage in a form that meets the above objectives and protects the public’s safety. An immediate increase in starting base salary level for all teachers (without creating a funding crisis for other areas of government). Development of broad-based portfolio of new revenue streams, or expansion of existing revenue streams, that does not disproportionately burden any single industry over another. Fundamental administrative reforms that provide school districts more flexibility to spend local funds. The Chambers support development of a long-term teacher pay plan that helps address the teacher shortage by rewarding teacher performance and experience or incentivizes teachers to work in high priority areas. This should include making sure Oklahoma is regionally competitive in the total days/hours of instruction time required. The Chambers believe public education is critical to Oklahoma’s ability to produce and attract a competitive workforce. Teacher pay raises, as described above, are paramount. In addition, the Chambers support Pre-K-12 education funding at levels competitive with regional states, while ensuring these taxpayer dollars are spent efficiently with positive outcomes for our future workforce. The Chambers support extending health insurance coverage to more Oklahoma residents, through pursuit of all available funds, to cover the costs of uncompensated care that is currently shifted to employers and health care providers. The Chambers support the State of Oklahoma’s efforts to work with the Trump administration to preserve Insure Oklahoma through securing a multi-year waiver from the federal government. The Chamber further supports broadening Insure Oklahoma to provide health insurance coverage to more of the state’s uninsured. The Chambers will support legislation to eliminate restrictions that prohibit continued modernization of Oklahoma’s alcohol laws. The Chambers support annual appropriations necessary to preserve and implement ODOT’s eight-year construction work plan.